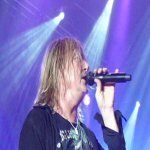 Def Leppard singer Joe Elliott has talked about the 2015 studio album and its proposed world tour. Joe talked at length to Rockline radio about the new songs, Dublin recording sessions, plans to finish off the album and a world tour in 2015. "The new Leppard record. We weren't even thinking really are we gonna - we were always gonna make a new record one day. We've been talking for the last year or so like is the record dead?. Are we just gonna do an EP or are we just gonna put a song out. Put it up on iTunes - a new song. So we didn't really know what we were doing. The industry doesn't know what it's doing. So we're just making it up as we go along as everybody else is but with a certain amount of experience of course. So we got together at my place in Dublin in February and maybe with the expectations of coming up with two or three songs and we came out of the other end of February with 12 things on the go. Two or three of them we could almost release tomorrow." "Direction?. As always with Def Leppard it's all over the place. There are some out and out rockers that sound like they could have been on Zeppelin II. There are things that could have been on Physical Graffiti. There's a couple of songs that sound like The Beatles. But with us when I say that it's like leaning that way. They've got the kind of oompa kind of keyboard sound that they would use on things like Lucy and stuff like that. We've got a couple of songs that are straight out of the 80s. We didn't restrict ourselves and say well we can't do that. We said well let's just do it and see what it sounds like and let it live and breathe and we'll come back to it in May. Which is what we're gonna do." "So we've done this first writing session. We've got these 12 things on the go at various different stages of undress. And we're gonna go back to my place in May - middle of May. We're gonna do about three weeks there. We'll work on the new songs for a couple of weeks then we're gonna rehearse for the tour. Then we're gonna do the tour and let everything percolate. This is the great thing you see the most important thing when you're in the studio is to get the backing tracks sorted. Bass, drums, guitars etc arrangements. If we're going la, la, la, la , la over the top. We can be writing lyrics on days off you know we can come back to that. And then when the tour's over we'll go back in for a third session and hopefully put this thing to bed. So that we can have a new album out for next year." "Let's just for the fun of it call it VIVA! Pyromania. I don't know whether we'll call this thing VIVA! again you know. Maybe the joke will be too you know not funny any more. But we were thinking about maybe doing that towards the end of this year but we're not gonna do that now because now that we've got so much going with the new music. We'd rather spend that month that we would have been in Vegas in the studio finishing a record so that we can have it out for next year. So that we can tour next year with a new record. So the Pyromania Vegas thing when it does happen and it will, will be more likely the late Winter/early spring of next year before a full on proper tour. Which will be everywhere, you know not just America it'll be Europe, Australia, Japan etc. If we're gonna do a new album it'll be a world tour."